We utilize an advanced and totally secure electronic health record for our patients. Our web registration system enables you to provide information at your convenience, from the comfort and privacy of your home or office. This paperless system allows for more effective, thorough and timely communication with your dentist. Dental x-rays can now be taken using an advanced dental imaging system known as CDR (computed dental radiography). This sensor produces an image directly onto a chairside computer monitor. This larger image helps the patient understand the doctor’s explanations and enables the doctor to optimize and archive the image to be sent to your dentist. An important advantage to this new technology is that it dramatically reduces the amount of radiation and the chairside time, as it only takes seconds to visualize an image. In addition, this new technology is friendly to the environment since no chemicals are needed for developing the image. We provide anesthesia with a revolutionary system called The WAND™ . The source of discomfort for most injections isn’t the needle, it’s the flow of the anesthetic. 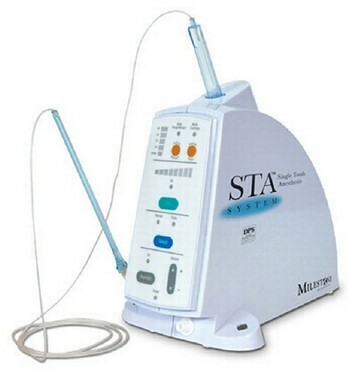 The WAND™ delivers anesthesia in a slow constant flow that is virtually painless. The onset of anesthesia is often faster, and most patients are pleasantly surprised how comfortable it feels. We perform all endodontic procedures using a dental operating microscope. It enhances our ability to accurately visualize complex anatomy cases, for locating root fractures or defects, for root-end surgery, for removal of separated instruments, and for locating canals. 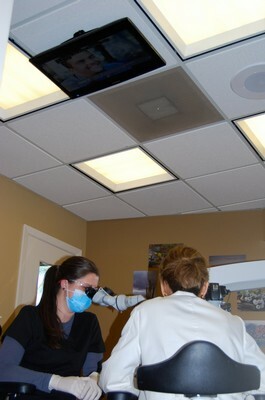 The operating field is viewed by Dr. Schindler as well as her dental assistant. The surgical microscope, facilitates visualizing areas difficult to reach, treat or repair, and thus, enables us to save teeth that otherwise would have been lost just a few years ago. We are very proud to be one of few endodontic offices utilizing 3-D imaging, also known as Cone Beam Computed Tomography (CBCT). This technology allows us to visualize the teeth and supporting structures in 3 dimensions. It dramatically improves our ability to diagnose and treat lesions that were impossible to detect just a few years ago. Our office uses a Kodak 9000 CBCT machine, which has the highest resolution available on the market today, yet dramatically limits radiation exposure. Our mission is to provide the finest endodontic care in a relaxed, compassionate and caring environment, while being committed to utilizing the latest advancements and innovations of science. One of the ways we support our mission is by providing you with a TV in the ceiling (as seen in the photo to the right) for your entertainment during treatment. You can watch your favorite channel on television, pick a movie or bring your own favorite movie on a DVD and we can play it for you. If music is your preference, tell us your favorite genre and we will make you comfortable.